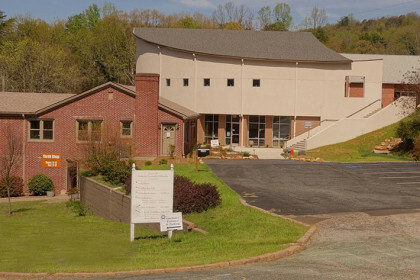 The Greenville Unitarian Universalist Fellowship (GUUF) is located at 1135 State Park Road, at the intersection of Piney Mountain Road and Altamont Drive next to CVS. If driving north on Pleasantburg Drive (SC 291), turn right on to Piney Mountain Road (after crossing Rutherford Road). Turn left on to State Park Road. The Fellowship is on your right (after the CVS Pharmacy). If driving south on US 25 Business/US 276, turn left on to North Pleasantburg Drive at Cherrydale Point, then left on to State Park Road (Hwy 253). The Fellowship is the 3rd church on the left. If you pass the CVS Pharmacy, you have gone too far! If coming from out of town on I-85, take I-385 North (toward Greenville) and then SC 291 north (also labeled at Pleasantburg Dr.). Follow the directions for going north of Pleasantburg Dr. above.